It was on the night of 17-18 June in the year 1239 that Edward I was born. 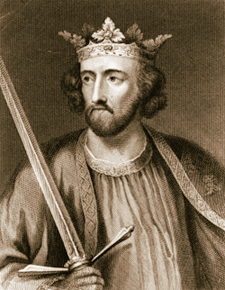 His mother Queen Eleanor had been brought up in Provence, France and married to his father King Henry III when King Henry had been 28 years old and she had been only 12 years old. However by the time of Edward's birth, she was by all accounts a great beauty, both charming and elegant and Henry was very much in love with her. Eleanor had not been accepted too readily at court because at that time, foreigners were viewed with a great deal of suspicion. However in providing King Henry with an heir to the throne, she had succeeded in her most important duty and at the birth of Edward, a healthy baby boy, there was great celebration at the Palace of Westminster. The name that King Henry gave to his newborn son, gave many clues to his personality. His family were direct descendants of William the Conqueror who had seized power in England 170 years earlier and most of the nobles surrounding Henry in his court were directly descended from William the Conqueror's immediate courtiers. The language which they would all have spoken would probably have been a fairly anglicised Norman version of French. Right: Edward I (1239 - 1307), King of England, circa 1275. Original Artwork: Engraving by William Worthington after a drawing by Vertue. Why did Henry choose Edward as a name for his newborn son? - after all Edward was quite an unfashionable name in the year 1239 and no king had been given that name since the Norman conquest probably due to the fact that it originated in the side that had lost the battle at that time, being an old English name. In fact the newborn child was almost certainly named after Edward the Confessor (below left), the penultimate king of Anglo-Saxon England whose death in January 1066 had led to the succession crisis that eventually brought on the Norman conquest nine months later. In spite of this however, Edward the Confessor's reputation in Henry's time was such that his reign was viewed somewhat as a golden age and the Confessor himself was viewed as a man of great goodness so much so that he had been officially recognised as a saint. King Henry himself seemed to identify very much with Edward the Confessor and it would seem that he viewed him as almost the perfect role model. Henry's love and respect for the Confessor was so great that from 1245 he spent vast sums of money rebuilding Westminster Abbey for a second time replacing the old Romanesque church with the massive Gothic building that stands there today. (The original stone abbey had been built around 1045–1050 by Edward the Confessor as part of his palace) It should therefore come as no surprise to anyone that King Henry should name his newborn son in honour of Edward the Confessor. Oddly enough there had already been 3 kings of England named Edward before Edward I: the Elder, the Martyr and the Confessor.